The suicide bombing of the Sehwan shrine is an ominous development for the world, in a region that badly needs stability. PHOTO: AFP. 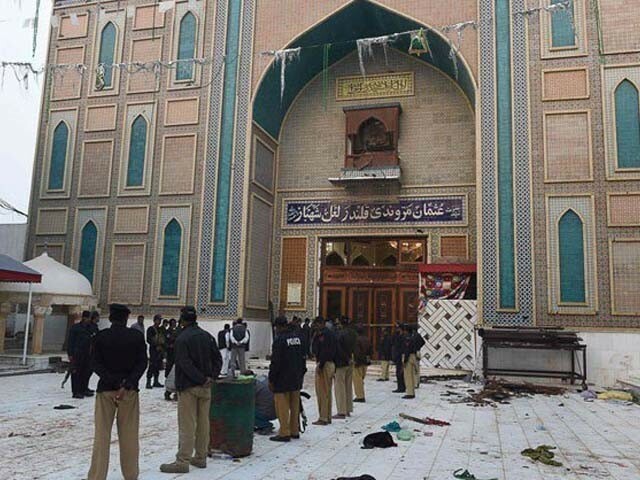 Last week, only three days after a suicide bomb went off in Lahore, an Islamic State of Iraq and Syria (ISIS) supporter struck a crowd of Sufi dancers celebrating in the great Pakistani shrine of Sehwan Sharif. The attack, which killed almost 90, showed the ability of radical Islamists to silence moderate and tolerant voices in the Islamic world. The attack also alarmingly demonstrated the ever-wider reach of the ISIS and the ease with which it can now strike within Pakistan. ISIS now appears to equal the Taliban as a serious threat to this nuclear-armed country. The suicide bombing of the Sehwan shrine is an ominous development for the world, in a region that badly needs stability. It is an Islamic shrine where outsiders, religious minorities and women are all welcomed. Here, 60 years after Partition and the violent expulsion of most of the Hindus of Pakistan into India (and vice versa with Muslims into Pakistan), one of the hereditary tomb guardians is still a Hindu, and it is he who performs the opening ritual at the annual festival. Hindu holy men, pilgrims and officials still tend the shrine. But the wild and ecstatic night-long celebrations marking the Sufi saint’s anniversary were almost a compendium of everything Islamic puritans most disapprove of: loud Sufi music and love poetry sung in every courtyard; men dancing with women; hashish being smoked. Hindus and Christians were all welcome to join in the celebrations. What happens at the Sehwan Sharif shrine matters, as it is an indication as to which of the two ways global Islam will go. Can it continue to follow the path of moderate pluralistic Islam, or – under the pressure of Saudi funding – will it opt for the more puritanical, reformed Islam of the Wahhabis and Salafis, with their innate suspicion (or even overt hostility) towards Hinduism, Christianity and Judaism? Islam in south Asia is changing. Like 16th century Europe on the eve of the Reformation, reformers and puritans are on the rise, distrustful of music, images, festivals and the devotional superstitions of saints’ shrines. In Christian Europe, they looked to the text alone for authority, and recruited the bulk of their supporters from the newly literate urban middle class, who looked down on what they saw as the corrupt superstitions of the illiterate peasantry. “We don’t like tomb worship,” he said. He saw his role as bringing “the idol and grave-worshippers from kufr (infidelity) back to the true path of the sharia”. Saleemullah’s organisation alone ran 5,000 madrasas across Pakistan, and was opening a further 1,500 in Sindh. According to one recent study, there are now 27 times as many madrasas in Pakistan as there were in 1947 – over 8,000 in total. The religious tenor has been correspondingly radicalised – many Sufi sites and people have come under attack, including the Data Darbar shrine in Lahore in 2010 and the revered Sufi singer Amjad Sabri, who was assassinated last summer. If only the Pakistani government could finance schools that taught respect for the country’s own indigenous and syncretic religious traditions, rather than buying fleets of American F-16 fighters and leaving education to the Saudis. Instead, Pakistan is increasingly coming to resemble a tragic clone of pre 9/11 Taliban Afghanistan – a place where violent radicals are welcomed with open arms, where groups like ISIS are rapidly gaining influence, and where moderate Muslims and religious minorities are subject to persecution and murder. Well, not far from the truth. Its for the people of Pak to decide what they want to do with their nation . Sounds like a hippie party. A society that indulges in all these vices is a morally depraved, decadent society, according to purists. Allama Iqbal is influential in developing the mindset of a typical Pakistani. He wrote that the job of a “Momin” is to be like a hawk, vigilant and ready for battle. To cast terror into the hearts of “Aghyar”. Men lost in music and dancing end up conquered and enslaved, as did the last of the Mughal Kings by the Europeans two centuries ago. every courtyard; men dancing with women; hashish being smoked. Hindus and Christians were all welcome to join in the celebrations. This does not represent Islam per se, not the sufi or traditional prctice, but a group of jolly people who are having a good time in a country which is experiencing a civil war. It matters not if the madrassas are financed by the Saudis or Qataris or the Good people of Pakistan rich as long as they are used to provide basic lessons in religion as well as science subjects and not being instrumentalised to convey an ideology which encourages violence and extremism and not tolerence and aims to create community disorder. What about Deobands of India? Are they also from Wahhabis? Did Wahhabis teaching responsible for Mapilla riots? Was Pakistan creation funded by Saudi Arabia also? Islam is a religion of Saudi Arabi not Pakistan. Vedas and Natyasastra cannot be part of Islam. Nawab Siraj ud dawla, the Nawabs of Lucknow and Nawab Tipu Sultan lost their domains to the British. The last Mughal emperor was Bahadur Shah Zafar who was exiled to Rangoon after a failed coup against the East India Company. lol. I don’t know how progressive it would be but certainly less violent. They were not Mughals. Zafar only ruled Delhi and he never tried to coup.